Baidu Antivirus for Windows 10 - anti-virus solution with USB scanner. The program contains a signature analysis core, a cloud interaction method and the Avira Antivirus engine, is capable of removing a large number of virus, trojan and spyware threats, includes an antispam module and a tool for uninstalling adware browsers. The utility uses a protection module for keyloggers, screen captures, manipulators and connected webcams, and allows you to store billing information. The program includes an updated database of signatures, can scan traffic in real time. 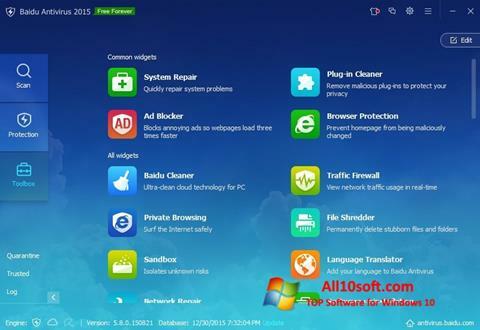 You can free download Baidu Antivirus official latest version for Windows 10 in English.